The past few weeks I had taken the much needed vacation. I visited my Sisters place and recorded a few songs. This is an amazing song written by Shree Indiresha Dasaru – ಇಂದಿರೇಶ ದಾಸರು. Thanks Suma for the amazing melodious voice. God Bless You! This entire song is basically asking Sri Lakshmi to give new eyes so you can see Vasudeva’s suta- son, Sri Krishna. Each verse is asking Lakshmi to rid the worldliness of desires to food, pleasures, relatives, so you can get to Sri Hari. Listen to song sung by my Sister Suma. I will post the lyrics here soon in Kannada and English. Hope you all had a wonderful and joyous Shree Krishna Jayanthi/Janmasthami. The festival was on a Sunday, so we had time on Saturday to do all the shopping and Monday to rest since it is Labor Day here and a holiday. 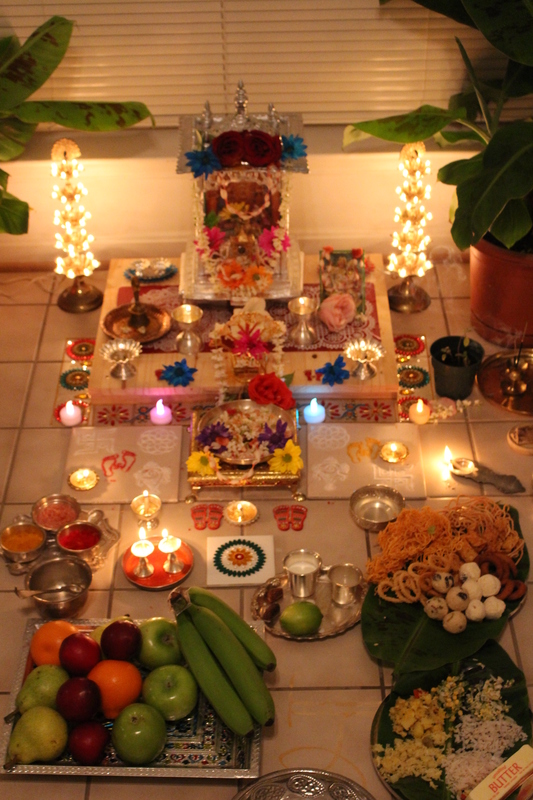 It was tough setting up the Pooja upstairs, so we decided we will do it in the Pooja room downstairs. It was tough even with that since by mid afternoon my ankle had completely swollen. I was to be honest really really depressed and kept wondering why this tough challenge, still unable to sit down, or even do activities I used to perform so easily just a few months back. So most frying was done by my Husband. My Daughter joined us through FaceTime during the pooje at night and was there until the end when we gave Argya to Lord Krishna. I just love technology, we can meet, share, see and perform ePooja remotely. And today morning as I do every year, I was able to show my parents all the pooje which we had done. My dad as soon as he saw said ” So beautiful, looks like the pooje has been done in a temple.”. I had tears of joy hearing this from my Dad. My own blog helped in getting all the links for songs, food items and recipes. Last year it was yellow rose flowers and this year we brought Red roses. And as always, I tied a Tulasi Garland for our Putta Krishna. Now for the next big festival Shree Gowri Ganesha Festival. Will post all links and recipes as we approach the festival. May Lord Krishna Bless us all. Jai Shree Krishna! There are many festivals during this month and as always I will re-post slokas, pooja details and many more details a few days before each of these important dates. Here is a list of important dates and festivals during Shravana Masa 2018. Please refer to the closet temple or other calendar to find the dates of the festivals in the country you are living. These dates posted are based on Indian Standard Time. I have posted the lyrics for this very famous song written by our Beloved Rayaru. I also taught this song to the ladies in our Satsangha group. Two weeks back found this picture on FB and couldn’t control my tears. It is an amazing picture, may our Beloved Rayaru bless whoever painted this picture. All credit goes to the person who painted. I am just sharing to show how beautiful and heart touching the picture is. Look at how Rayaru is singing and how Lord Krishna one hand behind and another holding a flute is looking at our Beloved Rayaru. Just stunning picture. I read on FB the following contents. All credit goes to the person who posted the picture and the text. Today Makara Sankramana. The idol of Lord Sri Krishna (Bala Krishna) at Udupi temple was installed by Sri Madhvacharya on this sacred day of Makara Sankramana. Sri Madhvacharya in his famous Dwaadasa Stothra (8th canto) eulogizes the Supreme God and recommend to Propitiate Lord Vaasudeva who is the most precious jewel (SarvaDevasikhaamanih) in the august gathering of Gods headed by Lord Brahma. We had an amazing satsangha today at Ms. Rajani Srinivas house at Maryland. Ms. Rajani sang a song on Lord Krishna which was so meaningful and beautiful. I asked for her to send me the lyrics, and so I am posting it here to help all my extended family. The song like I said is beautiful, heart touching and so emotional. Thanks Rajani for the lyrics. Below is the link for the lyrics and the video on youtube. And below is the video on youtube.